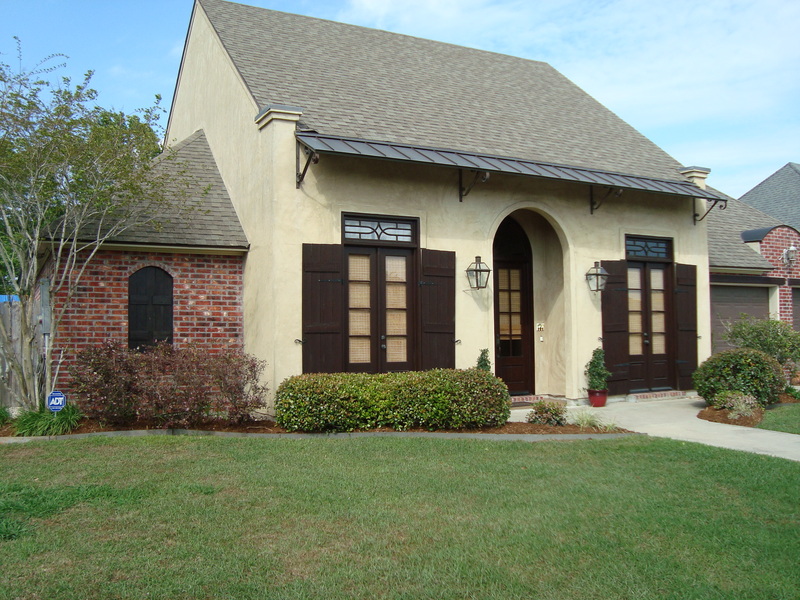 This beautiful New Orleans style home located in Southlake Plantation in Youngsville has 3 sets of Spanish Cedar French Doors with Hurricane shutters, Gas Lanterns and a Copper Awning. This large 3 bedroom, 2 bath home has an open floor plan with Australian Cypress Floors and custom built-ins in the den and bedroom. A split floor plan that has 9, 10, 11 & 12 ft ceilings, as well as double and triple Crown molding throughout. The large, open kitchen has Rustic Beams, granite slab countertops and a 5-burner gas stove that will make all of your meals a joy to prepare. Just off the kitchen is a large Bar/Butler’s Pantry, with granite counter & plenty storage. The kitchen opens up to the spacious den, with a gas fireplace & large Flat Screen TV custom mounted above. The den and patio are wired for surround sound. This home is perfect for entertaining! Faux finished ceilings in formal dining and master bedroom. The large Master bedroom has a tray ceiling, and double French doors leading into the Master Bath. Master Bath has a barrel ceiling, leaded glass window and a beautiful chandelier above the oversized Jacuzzi tub. 2 antique mirrors above his and her sinks, and an extra-large walk-in closet. The office sits right off of the Master bedroom. The oversized laundry room has plenty of counter space and a recently added storage closet. The extra-deep garage has a storage closet as well! Out back is a lovely covered patio, overlooking the very large, private back yard, with a recently added (10 X 16) wooden storage building. This absolutely amazing neighborhood features a fully stocked lake for fishing, with ducks for viewing pleasure, as well as a swimming pool, children’s playground, and even a basketball court. Incredible neighbors, this home is located in the very desirable Youngsville school district for Ernest Gallet Elementary and Youngsville Middle. A MUST SEE! !